Working with leather involves almost all of your senses. The rough feel of the untreated leather, the smoothness of the finished product, and the delightful smell of finished leather are all a joy to experience. Creating a leather gun holster is a great project for someone just beginning leather work as many of the techniques such as cutting, shaping and stitching the leather can be subsequently applied to more intense and difficult leather projects. You will also have a beautiful handmade piece of worked leather that can last for many generations with proper care. Lay your pistol over a sheet of paper and trace around the muzzle, barrel and trigger. Flip the position of the gun horizontally and trace around the same parts of the gun. Remove the gun and a draw a straight horizontal line connecting the two tracing of of the gun. This should leave a "V" shaped pattern. Cut this out and place this over your leather. Using a razor, carefully cut this pattern out of the leather. Flip the leather over so that the smooth side is down. 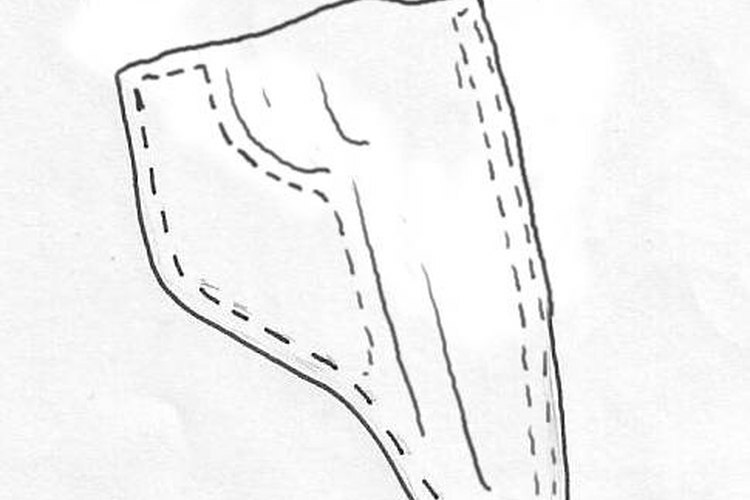 Fold the right side over the left to create the base of the holster. Drive a leather awl along the sides about 1/4 of an inch away from the outside edge. Drive the awl diagonally down and to the left for each and every hole. Place these holes 1/8 of an inch apart all around the sides except the top. Stitch the sides of the holster together using a leather needle and five cord waxed linen. Begin the stitch with by starting under, then over, then under and back over before going under and over to the next section of holes. Place the leather in a bucket of water for a full day. Remove the leather and place your pistol (wrapped thoroughly in Saran wrap or another thin water proof material) inside the holster. Press the leather into the gun and along the sides of the gun to ensure that the leather dries into the form of the gun. Let this dry for a full day. Remove the gun and drill holes as you did with the edges of the holster 1/8 of an inch away from the impression of the gun. Do this for both sides and stitch closed. Run an over stitch wheel across along all of the stitching to press them down into the leather and make the stitches look more professional. Cut two curved holes 3 inches long and 1 inch wide into the upper back section of the holster for the belt holes. Sand the edges of the leather gently with 200 grit sand paper. Apply a coat of water resistant leather finish to the entire holster with a soft cloth. Let this dry overnight and your holster is completed. Use bone or antler to rub and press against the gun while it's forming the leather. Be sure to put a piece of scrap leather under your work so you don't damage the point of the awl when pushing the holes.